It was 5am when I sat up in my sleeping bag, in a make-shift bedroom I had made for myself in the back-seat of my hire car - parked precariously in a lay-by at the side of the road somewhere on the South Coast of Iceland. I had draped coats and scarves and anything I had in my duffel bag to try to block the light and give myself some sort of privacy in the night, and as I pulled down the ‘curtains’ that morning I could finally see where I had ended up when I was too tired to drive anymore through the lashing rain and darkness the night before. A vast, flat landscape that I thought resembled the Yorkshire Moors, yet with that distinct, otherworldly charm that can only be Iceland. I have been lucky enough to travel to a lot of incredible countries in the world, but Iceland was certainly the closest place I had come to something resembling Mars on this planet. As I wound down my window to feel the brisk air, I admired the endless horizon of springy mosses - one thousands shades of green and yellow and beige. The sky was still grey, the wind was still howling, but at least the rain had subsided partially. I didn’t bother getting changed just yet, I just crawled into the driver’s seat and drove the final two hours to my destination in my tartan pyjama bottoms and fleece, with tired yet restless eyes in awe of the landscapes and horizons and ocean I was whizzing past. How I ended up in Iceland is a rather interesting story. It was a long time coming in terms of me wanting to visit the country, and yet it happened so quickly in the end. My sister and I set up ROAM Magazine around a year ago; a collaboratory platform to allow writers, photographers and travelling creatives to showcase their work, and to share the beauty of the world and its cultures. It has become something that a lot of people love, and it resulted that I was invited to Iceland by Inspired by Iceland to explore the creative scene in the city of Reykjavik. I wrote about this brilliant trip here; eating lavish dinners and discussing art, politics and the state of the world with the wonderful Icelandic people we met there. Yet I knew that what I wanted to see most in Iceland was beyond the city. So at the end of the trip, I extended my flight by two days, hired a car from Reykjavik and set off to see as much of the country as I could in 48 hours. I had a destination in mind, like a beaming beacon I was embarked towards the Jökulsárlón Ice Lagoon with it’s floating bergs of jagged ice and gentle turquoise waters. It became a fixation and I had to see it. 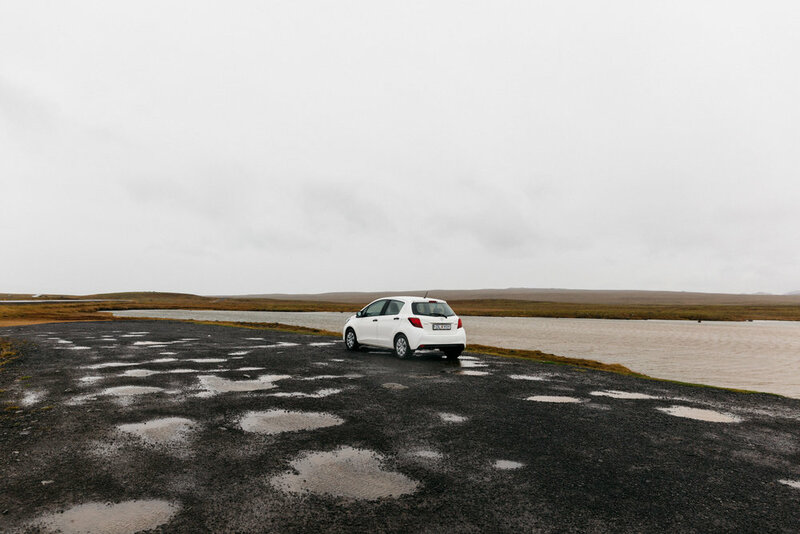 At 500km from Reykjavik, I knew I’d have to drive far to get there and back in two days; but I was alone and I was determined and sometimes I’m just a little too stubborn for my own good… So this is the story of one girl, a white Toyota Yaris and a 1000km journey in Iceland. Now don’t go thinking that this story is quite as simple as driving down long, beautiful Icelandic roads and photographing stunning landscapes… My first hurdle came at the hire car centre - how do you start this damned car? I was probably sat there for a good 10 minutes turning the key over and over again before I gave in and tottered inside, trying to convince the Icelandic man who had just given me the keys that I could in fact drive, and drive manual, but no I cannot start this car. As it turns out, you have to press both the clutch and brake down while turning the key, so slightly embarrassed I drove away from Reykjavik, eager to escape the city and its judging eyes. 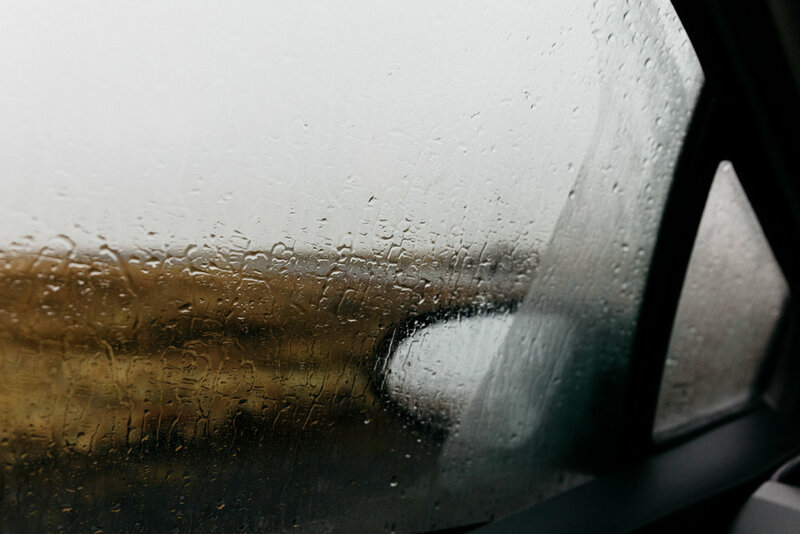 As I headed more and more into the Icelandic wilds, the landscapes became vast and barren, the rain pounded on my windscreen and the wind almost blew the door of my car off as I attempted to escape the inner confines to take a photo… It became clear that the weather wasn’t going to be kind to me that day. But this was Iceland, and wild weather isn’t exactly uncommon. My first destination was Bruarfoss Waterfall, and let me tell you this is not the easiest place to find. In fact, I’m pretty sure I parked illegally on private property before trudging through ankle deep mud and chin-high prickly bushes before I finally found the waterfall. It was autumn and the surrounding hills were the bright colours of orange, red and gold, a stark contrast to the wintry glacial waters that gushed into one long turquoise stream. Bruarfoss is a bit of a hidden gem; like a little trick that the Icelandic people are playing on tourists, “here’s a photo of a beautiful, turquoise waterfall. Now, if you want to see it, you have to find it for yourself…”. 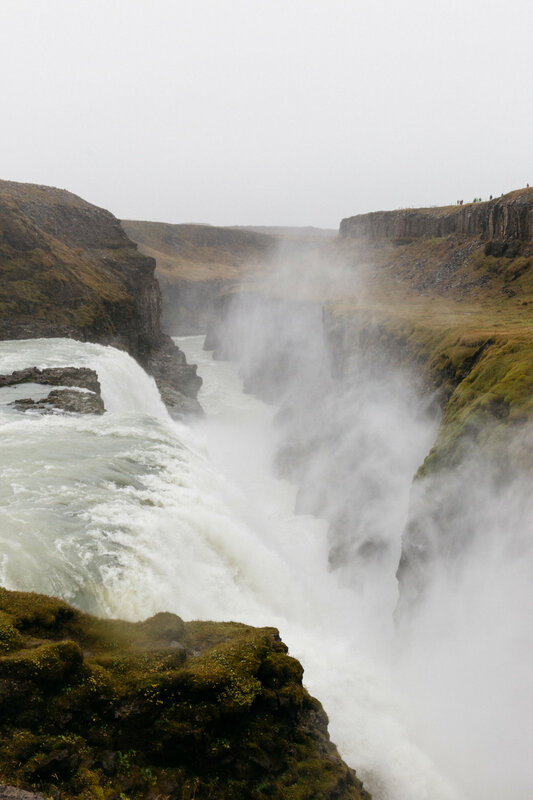 From Bruarfoss I headed to Gullfoss where gushing water sent water rising like steam into the air and I had to tuck my camera under my raincoat to avoid it getting too wet. Then onwards to Skogafoss, where the parking was overpriced and too many tourists stood in the way of this remarkable piece of nature, eager to get their selfies. I was feeling overwhelmed by the scenery yet also a little dejected by my inability to escape the crowds of people heading down Route 1 as I was, so I whizzed further east; driving for an hour or so listening to Carole King and Haim as the rain continued to lash down out of the overhanging dark grey clouds in the sky. At some point on this journey, as I’d been lost in thoughts of loneliness and loud singing, I realised that the roads were finally clear. Having left behind the famous waterfalls, I had also left behind the tour buses and selfie sticks and overpriced parking. I also realised that I had accidentally driven to Mars… or something resembling it at least. Black sand on either side of the road spanned as far as the horizon looking south and as far as the mist-covered hills looking north. The sky was still dark and oppressive but the rain had subsided, so I pulled into a parking area, yanked on my walking boots, swung my camera over my shoulder and followed the sound of waves. I wrote a bit about what happened next here, but in short I walked and walked and walked, found a plane wreck, found some wild waves, stood on the shore with my arms outstretched and face to the sky and just b r e a t h e d. And then I got soaked through to my skin on the journey back and sat in my car for a few minutes contemplating life and how I had ended up here and everything else in a small existential crisis somewhere at the side of the road in Iceland. After that, I drove into the night until I could no longer see the valley anymore. I was enjoying just driving, being far far away, and having time to think about the summer that had left me feeling lost and a little - dare I say it - sad. I was enjoying this aloneness but at the same time I was lonely, and I didn't like it. I wished for a companion to chat away to in the car; to complain to about the weather; to laugh with when we both got drenched in the rain. All those annoying little things you encounter when travelling aren't nearly so bad when you have someone alongside you... I remembered that I was once the girl who announced boldly that she 'loved travelling alone' - and in a way, I still did. But in another way, I had to admit to myself that I was fed up of it, I didn't want it anymore. This isn't the realisation that you necessarily want to have when sat at the side of the road in a hire car in a foreign country in the middle of the night, so I loosely attempted to brush those thoughts - and the tears that came with them - away into the night. Tucked inside my sleeping bag on the back seat of a white Toyota Yaris, I’m balancing a gas canister and camping stove on a hardback book and cooking tinned beans and hot dogs in a titanium pan, stirring the tomato liquid slowly with a plastic spoon as the steam rises and warms my hands. The inside of the car is now humid and steamy and condensation has settled on the insides of the windows. Outside it is dark. All I can see is the continuous flashing light from a nearby bridge and rain drops clinging to the windows, hitting the glass with a sudden thud before dripping down slowly and dejectedly, like flies meeting their sorry end. I sleep restlessly for a few hours until the first signs of sunlight hit my windows the next morning. I only had to drive for a couple of hours until Google Maps told me I was arriving at the carpark for the Ice Lagoon. It was maybe 7 or 8am, and I was the only car there. I pulled on my jeans and followed my nose down a little path to the water’s edge, where I watched these striking blue icebergs floating on the grey water, with seagulls swooping down around them only intensifying the dramatic scene. I’d driven 500km alone to get here, and that fact left me feeling both satisfied yet deeply saddened at the same time, “I’m here, and now what?” my mind seemed to be saying. On my way back to my car, the heaven’s opened once more and I was soaked to my skin, tired and hungry; eager to head back to civilisation and reality. I drove for a couple of hours, the same way I had come the day before, until my jeans were dry enough and I decided to venture out exploring again. The weather, miraculously was improving and the sky even showed some signs of blue. All of a sudden, the landscapes that previously had been grey and dull yet dramatic were now the vivid shades of blue and green, otherworldly beyond belief. I remember distinctly driving down a long flat road of springy green mosses, the sun beaming through my wind-shield. It was completely mesmerising. I pulled over at the side of that road to eat super noodles perched on the boot of my car. What a strange, old life, I kept thinking, how did I get here? That final afternoon was spent exploring the deep, rocky canyon of Fjaðrárgljúfur, Dyrhólaey beach with its crashing waves and off-shore rock figures, Seljalandsfoss as a rainbow bowed over its falls, and finally the hidden hot springs of Seljavallalaug - that definitely weren’t hot! - as light faded around me. In 48 hours, I had experienced a whole range of weather, landscapes and emotions. There was something about the contrast of dark oppressive skies that led to sunny valleys and more rainbows than I had seen all summer that seemed to unearth a whole array of feelings within me. While I drove 1000km and my mind whirred non-stop, I don’t actually think I came to any internal conclusions about my state of aloneness versus loneliness; instead, I just accepted the confusion, sadness and happiness that merged together into something that had overwhelmed me greatly over the past 48 hours. I left Iceland only wishing to return and see more, to be dazzled by her weather patterns and landscapes, and to feel Mother Nature’s grasps take hold, shake me around a little and place me back down to earth. Iceland is addictive, but in complete honesty, I hope to experience it with someone alongside me next time. See a full photo set from my time in Iceland here, or read my ROAM Magazine article about the art scene in Iceland here.